Was he responding to our announcement? Not directly, no. It was actually a response to the Victoria International Jazzfest, whose slogan this year happens to be “Jazz ain’t what you think.” But his puzzlement over their slogan surely applies to ours as well. 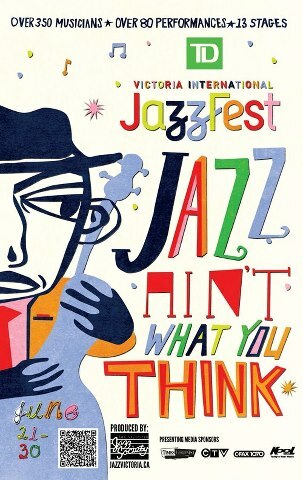 So, what does Mr. Hum find so puzzling about a slogan that suggests jazz may not be what it is perceived to be? For a start, he’s bored, as many others are, with “that tedious ontological debate about what jazz is,” and thinks that any marketing ploy that tries to capitalize on the idea that jazz “suffers from an excruciating identity crisis, and no one knows what it is,” is doomed to failure. The last option he considers is that their slogan is intended to signify that the Victoria Jazzfest is abandoning the grand tradition of instrumental jazz in favor of pop- and soul-infused “crossover vocal stuff,” which, he laments, is what “puts the most butts in seats” these days. Obviously, I can’t speak for any other festival but our own, and I have no idea what the producers of the Victoria International Jazzfest were thinking when they decided on their slogan. But as far as Offside is concerned, let’s rule out this last option right away. There will be absolutely no “crossover vocal stuff” at our festival, however many butts that might be likely to attract. It’s not that Alex or I have anything against that kind of music—it’s just not what rocks our boat, so to speak. It’s not what excites and compels us, as audience members or as curators and event producers. So, what does our tagline mean? Is it aimed toward jazz-fans or jazz-haters? Or is it just a “harmless throwaway line,” as Hum might hope? First, I take full responsibility for the line. When I wrote it, my first goal was simply to say something bold, attention-grabbing, and yes, Mr. Hum, something with sass. It was also, I confess, a play on the TV show, So You Think You Can Dance? Yeah, whatever. Now, despite my most excellent taste in music, I’m no authority on jazz. I’m neither a jazz musician nor a jazz historian, and I don’t claim to have any special insight on what does or does not constitute jazz. So, what on earth was I thinking when I wrote that line? I was thinking about my own journey that ultimately led to me co-founding a grassroots jazz festival, despite certain associations I had with the label that would seem to prohibit that very possibility. Let me explain. As a kid, my parents were both jazz fans. They liked mostly old style jazz, which was popular in Ireland when they were young—big band swing, bebop, and dixieland jazz. My father loved Ella Fitzgerald, my mother Billie Holiday. They both loved Louis Armstrong. On Sunday afternoons when I was a pre-teen, we would drive out to the harbor town of Howth, on the north side of Dubin Bay, to an old hotel that hosted a weekly jazz jam. I loved going there each week. Until I reached a certain age, that is, and the thought of spending Sunday afternoons with my parents just seemed like the most uncool thing ever. Skip ahead to my mid-twenties, when I moved to the Bay Area for graduate school. I had a boyfriend at one time who was a professor at another institution and about six years older than me. He was a huge jazz fan, but it was not the kind of jazz I had heard before, certainly not the old jazz I grew up listening to. I remember he would go to Yoshi’s, back when it used to be on Claremont Avenue, to see people whose music I knew nothing about, like Pat Metheny and Keith Jarrett. Although I was invited to go, I always declined. I viewed his obsession with jazz in much the same way I viewed his habit of wearing knit cardigans—something I tolerated because I found his “old-man” tendencies vaguely charming, albeit in a rather comedic way. I teased him incessantly about both his love of jazz and his cardigans. It was probably not till about ten years later that I finally rediscovered jazz for myself. That was when I started to go out regularly to see live music played by local musicians in the Bay Area. The jazz I was hearing—from the straight-ahead to the more adventurous—really ignited my interest and made me realize that I did, indeed, love jazz. How could I not? But certain associations I had with the label made me so closed-minded, I had written off a lot of it as “boring” without ever actually listening to the music. What were those associations? In a nutshell, that jazz was for middle-class, old, white guys who liked to wear cardigans. “So, you think you know jazz?” is a question directed at my former self just as much as it is directed at anybody else. I thought I knew jazz in my twenties and, as a result, I probably missed out on hearing some amazing music. Back then, I wouldn’t even consider attending a “jazz” concert, never mind a whole goddamn festival. And, I’m pretty sure, there are many others out there who are just like me. But will our tagline do anything to entice those who are not already sold on the idea of jazz? Well, I grant Mr. Hum that the line by itself probably won’t have much effect. By the same token, nor will the “Jazz ain’t what you think” slogan. But we didn’t use our line by itself. It was paired with a photo from last year’s festival and, as they say, a picture is worth a thousand words. To me, this photo subverts expectations, not exactly about what the music sounds like, but rather about who is producing the music, where they’re performing it, and, by inference, who the consumers of that music might be. For diehard jazz-haters, this piece of visual rhetoric will hardly convince. But for young people in their twenties and thirties, part of the demographic we’re trying to reach with our festival, it presents an alternative picture of what a jazz scene looks like. And it’s one in which they are included. It’s one in which they can see themselves. It’s cool. Definitely not the kind of jazz their parents or their prematurely middle-aged boyfriends might have taken them to. Of course, a picture of the super cool Esperanza Spalding or Vijay Iyer (who are both playing at the Victoria International Jazzfest) might convey the same message to this demographic, but with one significant difference. The price tag. The kind of festival that books folks of that stature, which, let’s face it, is pretty much every regional jazz festival in the US and Canada, is not going to be affordable to as many young people. Tickets to see Vijay Iyer perform in Victoria, for example, cost more than a full festival pass to Offside. Interestingly, Iyer recently played a free solo concert at Community Music Center in the Mission, which is where we host the last night of our festival in May. Afterwards, Alex asked him his thoughts about how to build specifically younger jazz audiences, to which he responded: make it affordable. And that is definitely what we are doing with our festival. We’re also focused exclusively on local musicians and composers. It’s not about flying in big names from out of town. It’s about celebrating the incredible jazz talent found right here in our own backyard. So, you think you know jazz? You think you know jazz festivals? We just announced the 2nd annual Offside festival on sfoffside.com. Here are the deets! So, you think you know jazz? Think again! Now in its second year, the SF Offside Festival presents three nights of incredible music that at once defines and defies the genre. Featuring the best and brightest of the Bay Area scene—including local legends Howard Wiley and Marcus Shelby, two-time Grammy Award-winner Mads Tolling, Bay Area bulwarks Dave Mihaly, Steve Adams, Sheldon Brown, and Jaz Sawyer, plus emerging stars from a new generation of composers, Aram Shelton, Lisa Mezzacappa, Jordan Glenn, and Alex Pinto—SF Offside demonstrates why San Francisco is on the cusp of becoming the epicenter for new innovations in jazz. Tickets are sliding scale: $10-20 at the door or $25-45 in advance for a festival pass. 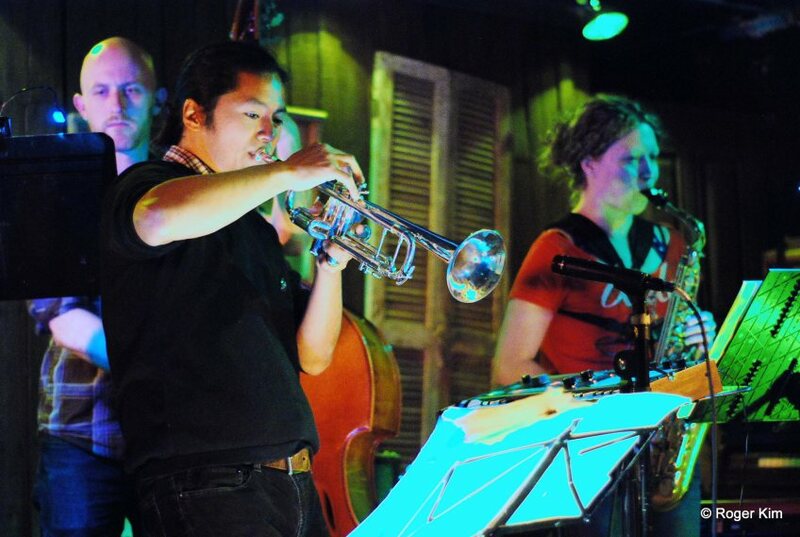 SF Offside was created to fill a perceived gap in the regional jazz festival circuit. With an exclusive focus on homegrown talent, our mission is to draw attention to the incredible creativity to be found right here in our own backyard, and to build larger audiences for specifically local jazz offerings. The inaugural festival took place May 24-26, 2012, garnering both local and national attention on its very first outing. Our hope is that San Francisco ultimately gets the recognition it deserves as home to a rich, diverse, and exceptionally talented jazz community. San Francisco Offside Festival is a fiscally-sponsored project of San Francisco Friends of Chamber Music, a not-for-profit organization dedicated to the service of chamber music in California.